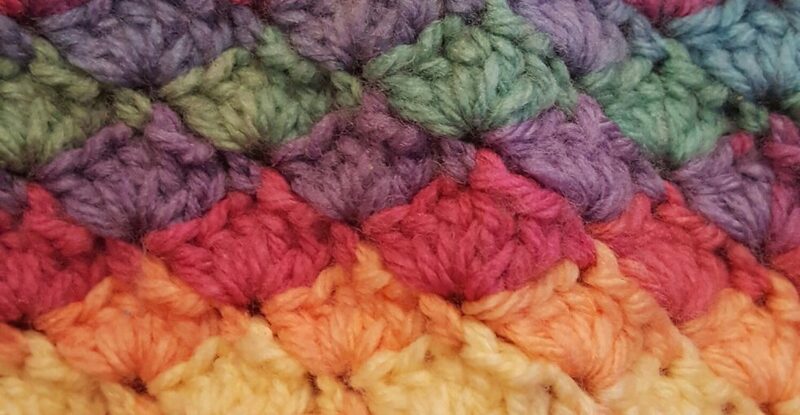 Not the most exciting topic, and for many it’s the least fun part of a project (see this post for more on the 5 stages of crocheting a blanket). However, they are important. Leave them dangling and your work looks scruffy. Just cut them off and, well, you run the risk of all of those hours of hard work unravelling in the washing machine. If you are a lover of frequent colour changes in your work then you could have to deal with literally hundreds of pieces of yarn! There are loads of ways to deal with them. Some brave, optimistic people just snip and hope. Others spend hours darning them in, and then there’s always the option of crocheting over the ends. I’m going to talk about the pros and cons of each way, and share some tutorials I have found that might help. It’s very quick and easy, no fussing required. It’s a bit risky, but can be useful in stuffed toys if you’re just trimming off a bit of the end and leaving a longer length to stuff inside the toy. It’s quick and easy, and also you do it as you go along so you aren’t left with a million ends to deal with when you have finished crocheting. It is quite handy for blankets. It’s only really suitable for projects where you have stitches close together, i.e. not lacy patterns. If you try it with more open patterns you will be able to see the yarn running through your work which can be quite unsightly. Also if the ends start coming out from under your stitches there isn’t anything else securing them and making sure they are firmly anchored into your work. 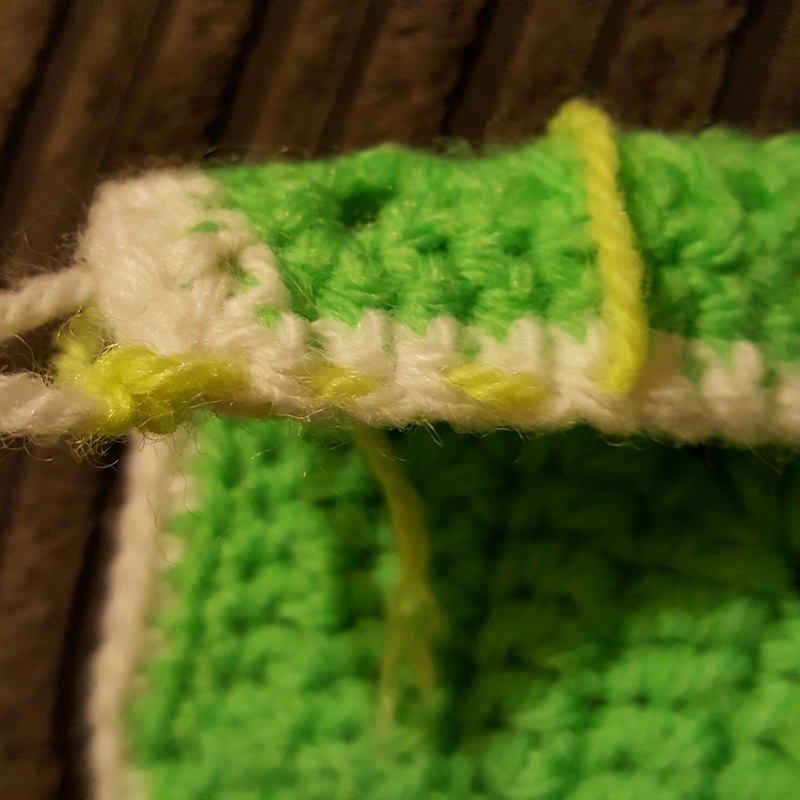 You can make the ends really secure by darning in using a needle or weaving in using a crochet hook. My preferred method is to weave in and out of one side of the loops then back towards the join. 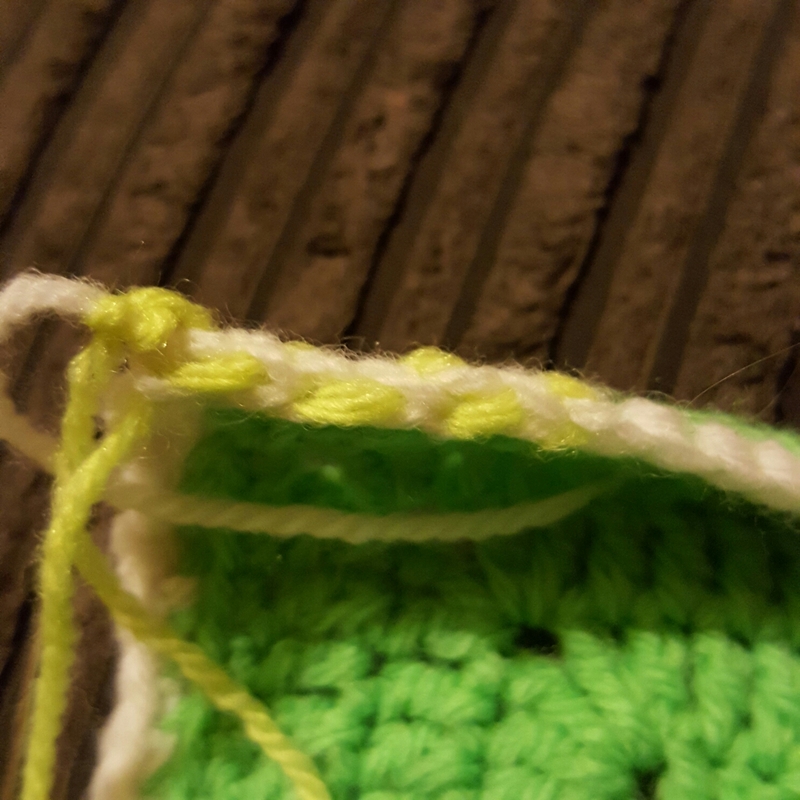 I always stretch out the piece of crochet slightly after darning so that it doesn’t unravel if the fabric is stretched later on. I then snip the end after that. I weave in and out of one side of the loops away from the join. Then I weave in and out of the other side of the loops back towards the join. Here’s some more methods for weaving in ends for you to try. ConsIt’s takes ages! It’s really handy for when you’re procrastinating about doing housework though. That’s about all there is to say about ends! Apart from what to do with the bits you snip off. Some people save them to use to stuff Amigurumi. How do you deal with yarn ends? Have you ever had an unravelling disaster? you make me want to crochet right now! Great post. I haven’t had time to look into all those methods yet – but I will – thank you. I save all the ends in little felted pots I made and use them for stuffing things and for the kids to use in collage and with Fuzzy Felt to make pictures. Longer bits left over are currently being tied together with a reef knot, rolled into a ball and crocheted into a random throw/seat cover for the caravan, leaving all the knots and ends on view. I have a blog post brewing on this! Love how you’ve done the Pros & Cons of the different methods too. Another awesome Post. Thank You!! Haha! I take break every few rows and do it as I go along otherwise I’d never finish a project! Yarn is super easy to deal with, thread, not so much. If only I could find a good way to deal with ends in my thread crochet lace! Any ideas?